I’ve been reading articles for years from various internet marketing gurus about the importance of email list building. The consistant message I have always heard was: “The money is in the list“. On my first blog, while I had a mailing list, I didn’t use it effectively. I only used the blog email list to deliver my latest posts via email to subscribers. When I started this blog, one of my goals was to more effectively use my email list and provide my subscribers with unique value and content just for them. Three years later, I still haven’t done that, but that will change very soon. Preparing for that change, I elected to move off of Feedburner. I’ll explain why below, but if you’re using Feedburner, migrating to another service is something you should be doing as well. Given I was a “noob” to email list building, I started off using the same email list service I used on my first blog, Feedburner. Calling Feedburner an email list service is probably a bit of a stretch, but it does get the basics done. I even recommended Feedburner as a good starting point for list building in my Start a Money Making Blog series. The great thing about the Feedburner’s email subscription service is that it’s simple to set-up and easy to manage. Feedburner is perfect for someone starting out and learning. As your list grows and you learn more about how to effectively use your email list, the limitations of Feedburner become apparent. The turning point for me was wanting to be able to send out a monthly newsletter that would summarize my articles for the month and include exclusive email only content. I also wanted to be able to immediately share special offers with my subscribers as they became available. Feedburner, while great for automatically emailing your latest updates from your RSS feed, was not a good fit for doing anything beyond that. The other big concern I have with Feedburner is it’s future. There is a great deal of concern across the web on whether or not Google will continue supporting Feedburner. Google had a significant Feedburner outage a few months back and it took them days to get it resolved. Additionally, the Feedburner interface hasn’t been touched in a long time. These are all signs that Google isn’t giving it much attention to Feedburner, and most likely won’t. I decided I didn’t want to risk it. Given my additional needs and the questionable future of Feedburner, I started looking at other options. Fortunately, I discovered two much better options very quickly and migrated to one of them. Within minutes of searching and reading a few articles, you’ll begin to see one name mentioned above most others, AWeber. AWeber is an outstanding email and list building service and AWeber has established themselves as the premiere provider. I spent a great deal of time reading over their services, and even signed up for their special “1 month for a $1 offer” (affiliate link) to try it out. AWeber was great. They offer outstanding quality of service, and more options than I could probably ever learn. But, I didn’t go with AWeber. Why? Well, as I’ve mentioned on here before, I’m a bit frugal. I don’t earn a great deal of income from this blog yet and until I do, I don’t like spending money (confession – even when I do make lots of money, I don’t like spending it). AWeber is a great service, but it costs $19/month or $228/year. AWeber absolutely seemed well worth it, if you have the money, I don’t right now. I continued my search. Another list building service that I consistently saw being mentioned and talked about was MailChimp. The great thing about MailChimp (other than their completely epic site design) is that for email lists under 2000 subscribers and if you send less than 12,000 emails per months, their service is free. The word free has this unique ability to completely capture my attention, and thus I signed up for MailChimp to try it out. Saying I was impressed would be an understatement. MailChimp is incredibly easy to use and their site design is probably one of the better ones I’ve seen. They also slip in some pretty funny jokes and puns throughout the user interface, which is hilarious and fun. Using their “wizards” I quickly created a few new campaigns, lists and played around with their email designer and available templates. They have lots of prebuilt templates and customizing them or even creating your own email template from scratch is really pretty simple. They also many pre-built sign-up forms as well that can be easily placed on your blog. When you sign-up, they also send you an email series that walks you right through the process of getting started with MailChimp and using their service. I found these really helpful. I don’t want to mislead you, I am in no way an expert on either product just yet. I am getting to know MailChimp pretty well, but still have lots to learn. AWeber I have used and I am familiar with it, but I don’t know all of the ins and outs. But, given what I do know at this point, I thought it might help to compare AWeber to MailChimp for you – just to give you a basis for making the decision that’s right for you. Free for less than 2,000 subscribers and if you send less than 12,000 emails a month. Really nice and well designed user interface. For those of you using affiliate marketing, MailChimp gives you credit on your account for each signup. For those of you using affiliate marketing, AWeber has a great affiliate program that pays 30% of each sale, plus 30% of ongoing payments. One item I’d like to address: There is a false rumor floating around in the internet that MailChimp doesn’t allow affiliate marketing. This is simply not true. In any case, both services are flat out awesome and provide great quality of service, support and flexibility. The features and money you have available should drive you to which decision is better for you. You can sign-up for MailChimp here and AWeber here. Both of these are affiliate links – hope that’s ok. If not, no problem: You can find MailChimp here, and AWeber here. 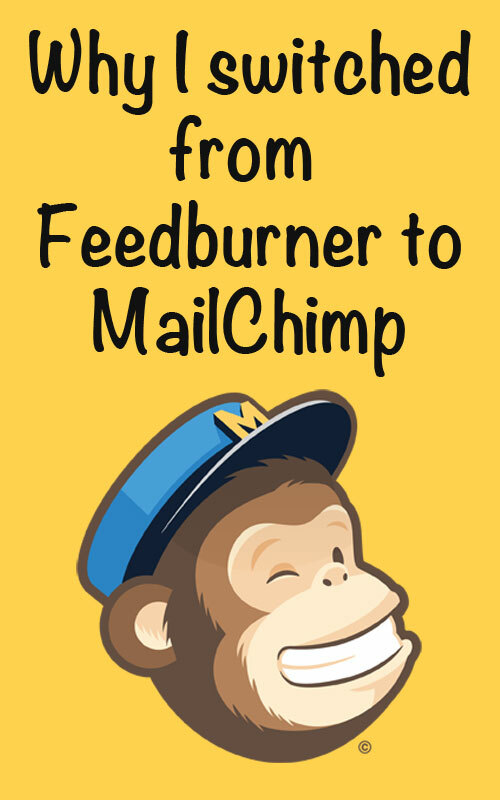 If you followed my Start a Money Making Blog series, and you’re currently using Feedburner – In an upcoming article, I’ll walk you through how to migrate from Feedburner to MailChimp. Don’t worry, moving over is really easy and I learned a few tricks (the hardway) that will really help you out. For those already using an email service: What are you using and why? Add a comment! Just made an account on mailchimps. Will be doing the same. Thanks a lot sir. Thanks for the information. I was looking into Feedburner for my new blog, but as pointed out, its future is unwritten. Signing up to mail chip now via the link provided. JuiceFast, you’re welcome. I’ve been really happy with them so far – no issues at all. Hope it works out well for you. Yeah I found your review very helpfull. I have several subscribers from feedburner to move into mailchimp. I want to ask about those mailchimp still use RSS feed for their source ? and how about time to spread email to subscribers that my feedburner subscribers often received late email into inbox. Soccer Picks – Glad you found it helpful. Mailchimp can use RSS as a source if you just want to send out your blog posts. That is what I primarily do right now. Works great. Time to inbox is really fast. My emails go out around noon, and they are in my inbox within 5minutes or so on average. Hope this helps, and thanks for using the affiliate link!